Wow, I found a Valentine's Day chocolate bar to review. How unusual. Normally there isn't much available and what is available I may have already looked at in the past (like Theo's My Cherry Baby bar). This is from the wordily-named Chocolate Chocolate Chocolate Company, and as you can see, the bar is a Strawberry Champagne Truffle Dark Chocolate. Not that I have ever had a glass of champagne with a strawberry inside and an edge rimmed in chocolate, but the image does look nice on the cover. Honestly, I've never eaten strawberries and champagne together, either, but these are classic pairings. The bar is in the usual clear wrapper; its eight squares are sleek and shiny. And I seem to have neglected reading the chocolate's description before tearing in, because I was surprised when I went to break off a piece to find a light pink center inside of the squares. You know, Ghirardelli style. That description calls this "a fresh cream truffle." I don't know that the effect is like a truffle, but okay. The aroma is a little boozy, though the flavor really isn't. The first taste is some regular dark chocolate, then some sweetness, and then everything melds into a complete chocolate covered strawberry experience. The strawberry element comes from strawberry puree, so I have no complaints about the strawberry flavor. While normally this isn't the kind of chocolate I would praise on its own, it works here because this is confection territory. This "kind of chocolate" is the kind that is mainly just sweet and not in fact dark in any sense of the word other than its color. Honestly, too, this is better chocolate than the kind that most places use to dip strawberries in (aka. compounded chocolate, which is chocolate that is made with oil). Maybe because that's the most common reference for chocolate covered strawberries that this whole chocolate covered strawberry chocolate bar effect comes across as so pleasing. And the champagne part? I don't usually taste it at all. 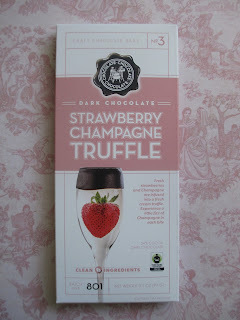 It seems to lurk in that pink center, so when you get a bite that includes a good amount of that center versus more of the chocolate edges, then you do get a sort of richness and a certain flavor that, while not necessarily the same as drinking a glass of champagne, is different from the flavors of either the strawberry or the chocolate. While this doesn't sound like much, it's enough. Unless this really were a truffle, just getting the strawberry to go along with the chocolate and have a hint at champagne is already covering sufficient ground. One random note: I have no idea why white chocolate is listed in the ingredients list. My comments, then, are pretty similar to what I said about the first bar I looked at from this company. While their chocolate isn't the absolute best, they handle flavors well, which most of the time is going to be enough. Most people don't even mind sweet dark chocolate (and would never even think to describe this chocolate in that way)--and even I said that it works in this context. So I will recommend this chocolate bar either for yourself or as a gift. It's an indulgence.